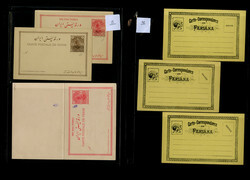 Cavendish Philatelic Auctions Ltd.: Cavendish Auktion - 816 - The Bernard Lucas Collection of Persia (Part 2) Auktion ist bereits beendet! 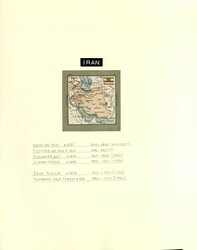 IRAN - 1868/1985, umfangreiche Sammlung im dicken...mehr IRAN - 1868/1985, umfangreiche Sammlung im dicken Schaubek-Album zusammengetragen mit zahlreichen gesuchten Ausgaben. Dabei ein sehr interessanter Teil frühe Löwenmarken mit besseren Werten inklusive verschiedenen Wertstufen, zahlreichen weiteren frühen Freimarken-Ausgaben, Aufdruckprovisorien, viele komplette Serien, dabei auch Flugpostserie 1927 ungebraucht mit Fotoattest (Mi.Nr. 544/59), Flugpost 1930, zahlreiche weitere Ausgaben aus den dreissiger Jahren und auch die nachfolgende Zeit sehr reichhaltig besetzt mit gesuchten Ausgaben wie z.B. 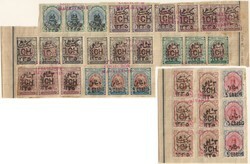 auch 20-200 R. Schah Pahlavi 1954 ungebraucht, 20-200 R. Schah Pahlavi 1957 ungebraucht, 50-200 R. Schah Pahlavi 1958/60 ungebraucht, eine Fülle von Sonder- und Gedenkserien, sowie im Anschluss noch ein reichhaltiger Teil Dienstmarken, sowie Portomarken. Ein großartiges Objekt dieses zukunftträchtigen Gebietes mit beeindruckender Substanz! IRAN - interess. Slg. der alten Marken auf 9 Seiten, dabei...mehr IRAN - interess. Slg. 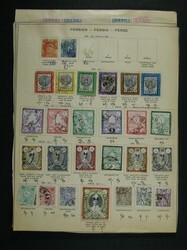 der alten Marken auf 9 Seiten, dabei viele bessere frühe Ausg., kpl. Serien, Aufdrucke, immer wieder mit teuren Werten, auch Nr. 222 im Paar **, Porto, Dienst mit Besseren, 2 alte Briefe etc. Selten angeboten! 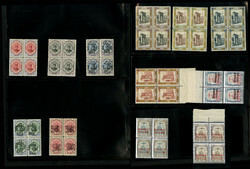 Album containing an interesting collection with duplicates 1875 up to...mehr Album containing an interesting collection with duplicates 1875 up to ca 1980 with quite a few better stamps included as well as some older covers. 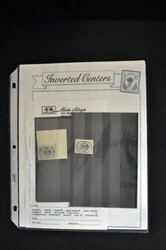 Many forgeries and reprints included. 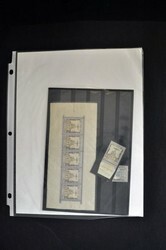 Please see example pictures on our website. 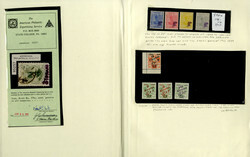 IRAN 1948-1979, überwiegend postfrische Sammlung der Sondermarken in...mehr IRAN 1948-1979, überwiegend postfrische Sammlung der Sondermarken in 6 Bänden Persiphila Spezialalbum, nicht häufig angeboten! 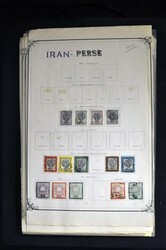 IRAN EXTRAORDINARY ACCUMULATION. 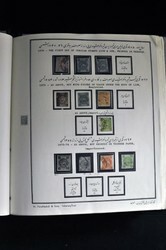 of many thousands of stamps from...mehr IRAN EXTRAORDINARY ACCUMULATION. 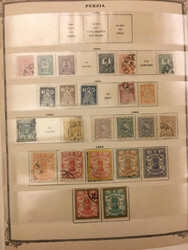 of many thousands of stamps from the 19th century to 1930s intensely crammed in a bulging and battered stockbook and organized roughly chronologically but nevertheless quite a chaotic presentation as there are so many stamps on the page, especially the first page which has hundreds of 1870s and 1880s issues, including Nasr-ed-Din 1880 1s mint and three mint examples of the 2s, huge postmark interest with ideal cds strikes incl. 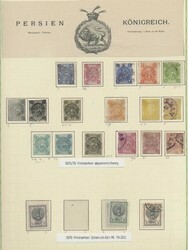 purple Schiras (Shiraz), dozens of 1881 lithographed suns incl. 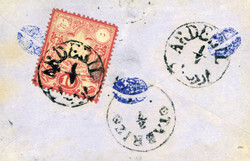 5c and 10c mint, 25c green used with blue postmark, 1882 engraved suns stuffed with genuine to 25c green mint, followed by the 1882/84 franc issues again with outstanding postmarks and incl. 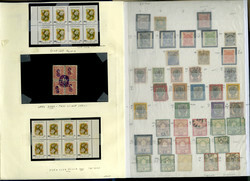 mint 10s, 50c gray and 1fr, used 50c buff and orange, etc. 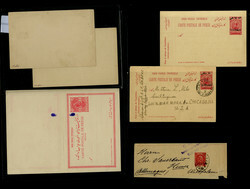 Then the 1885/87 surcharges incl. 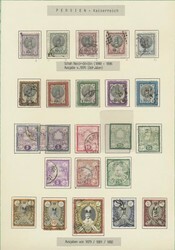 mint 8c on 50c gray, etc, through to the 1890s and early 20th century overprints and surcharges, here with highlights including 1897 set complete mint and used, as well as 2k on 5k mint block of four, the 1899 50k violet ornament ovpt mint, 1900 violet handstamps, 1902 "provisoire" ovpts complete used plus many extra mint and used, the same ovpt on CHAHIS/KRANS plus red and blue lion overprint galore, among which type I 50kr mint and type II 3c used, the 1903 12ch blue/purple surcharges with several of each, diagonal "1 CHAI", "P.L.Teheran" and many others. 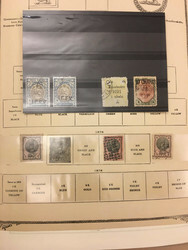 Further interesting areas are the "officiel" and "Relais" overprints, airpost overprints from 1927 onwards, etc,, some dubious/ reprints as usual bur overall F-VF; an exciting holding with enormous catalog on genuine issues alone and no doubt many discoveries to be made. 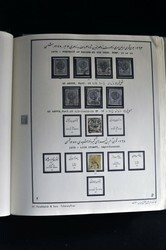 Iran, */used collection 1868-1905 on leaves. 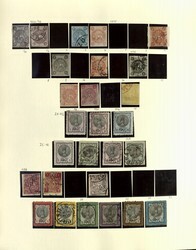 Interesting with many of...mehr Iran, */used collection 1868-1905 on leaves. 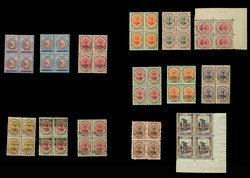 Interesting with many of the oldest stamps, and well filled. 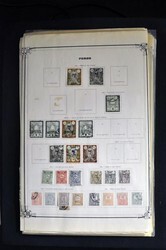 The entire lot is presented at www.philea.se. 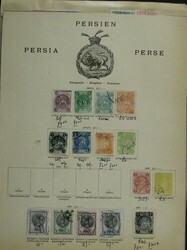 PERSIEN - 1876/1972, reichhaltige Slg. a. Blättern mit vielen...mehr PERSIEN - 1876/1972, reichhaltige Slg. a. Blättern mit vielen bess. Ausg. ab den Frühen wie Nr. 40/42, 46, 71/125, 129/44, 150/58, 166/70, 179/84, 200 *, 223/24, 288/324, 358/62, 403/08, 411, 413/15, 462/78, 497/507, 505/17, gute frühe Dienstmarken wie Nr. 1/6, Paketmarken, Iran usw. Hoher Kat.-Wert!